Forgive our adding an exclamation point to the title of the show; it expresses our enthusiasm for this original contemporary musical that shares with American musicals of days gone by some savvy storytelling and tuneful music. We recall from long ago a course we took called The History of Jazz. We learned that jazz began in New Orleans and was carried up the Mississippi River to St. Louis and Chicago. At first the tale was only words on a page; later it was the records we listened to as we traced the evolution of a genuine American art form. But now? Storyville! (sorry, can't help it) at the York Theatre shows us how it happened. As any writer will tell you, showing is better than telling. This musical illustrates the events surrounding the demolition of a seedy part of New Orleans, not far from The Latin Quarter, inhabited by people of color who made music and ran brothels--women who sold their bodies and the sailors who bought their love. The year is 1917 but no mention is made of WWI. The book by Ed Bullins is a fine one, telling the story of one Butch "Cobra" Brown (Kyle Robert Carter) a trumpet player and ex-prizefighter who arrives in Storyville, hoping to find a job in a band. He comes up against the crooked Mayor Mickey Mulligan (D.C. Anderson) and Hot Licks Sam (Michael Lenard James) who wants no competition; he falls in love with the proud and talented Tigre Savoy (Zakiya Young) who holds herself for music alone and arouses the spite of the other young women in the "sporting house". Narration of the story is provided by Countess Willy Danger (Ernestine Jackson) who dresses in men's formal attire. 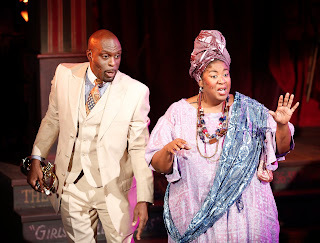 Local color is provided by Mama Magique (NaTasha Yvette Williams) who casts a mean voodoo spell. The music (by Mildred Kayden who wrote some fine lyrics to match) is beyond tuneful; toe-tapping and humming seemed about right. All of the songs were music to our ears, so to speak, but a couple numbers were memorable. "The Funeral" opens the show in true N'awlins style. "Back O'Town Rag" got everyone moving. "The Blue Book" let the "ladies of the evening" (Karen Burthwright, Dameka Hayes, and Leajato Robinson) strut their stuff. Ms. Young has a lovely ballad "Riffs and Breaks" as well as a fine duet with Mr. Carter "What's For Real". Spoiler alert! Although the piece begins with a funeral, it ends happily for all, except for the charmingly slimy boulevardier Baron Fontainebleau (Carl Wallnau) who doesn't get the girl. Pianist William Foster McDaniel was Music Director of the seven-piece jazz band which never let up on the energy. Director Bill Castellino served the piece well and kept the action moving along. Each song rose out of the action and never failed to seem motivated. The single set was created by Producing Artistic Director James Morgan--a small stage on one side, a bar on the other--and everything just as seedy as one might expect. The dazzling costumes by Nicole Wee fitted each character to the proverbial "T". Michael Gottlieb's lighting was effective, as was Mercedes Ellington's choreography. We have been known to express some violent objections to over-amplification; not so here. Janie Bullard's Sound Design permitted the singers to be understood above the music without hurting the ears. It is well worth noting that The York Theatre Company is the only theater in New York that is committed to developing and producing new musical theatre works and has been doing so for over forty years. Rediscovering musical gems of the past is also part of their mission. Storyville will be performed until August 17th and we predict that tickets will be hard to get. Don't miss out!